There is a story in "Book of Han" about a rich man who was a lover of antiques. Among his large collection was a rare vase made of jade. The vase was of exquisite workmanship and of historical value. He loved it dearly. One night, he noticed a mouse jumped into the vase and was trying to eat some food which the man had carelessly left there. The sight infuriated the man. In a fit of rage, he threw a stone at the mouse. For sure, the mouse was killed, but the precious vase was also broken. The loss of the vase pained the man greatly. He deeply regretted his own thoughtlessness had brought such unrecoverable loss. He now realized that anyone who only cares for the present and overlooks consequences is apt to bring disasters upon himself. So he sounded a warning: People should not ruin their precious things to get rid of a mouse, but hesitate to pelt a rat for fear of smashing the dishes beside it. 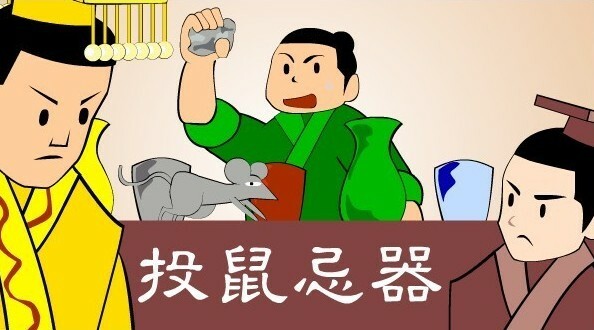 Now, the idiom "tóu shǔ jì qì" is mainly used to refer to people who are cautious in taking action.